Pulse Input - 10 kHz Max. The DPF11 miniature batcher is ideal for all batching applications. The display will show Batch Amount, Rate and Batch/Grand Total at the push of a button. The Start and Stop buttons make batching simple. 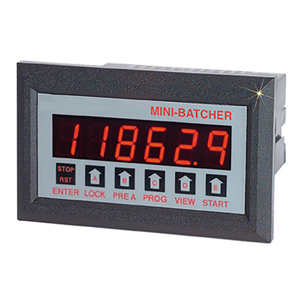 The DPF11 is a 6-digit totalizer and 4.5 digit ratemeter with two relay outputs. One output is dedicated to the Batch Amount (Preset A), the other can be activated for Prewarn or Batch/Grand Total. The unit can count up to the preset (reset to 0) or down from the preset (set to preset). Start, Stop and Reset functions can be activated from the front panel or remote inputs. An analog output (assignable for Rate or Batch Amount) is optional for data logging. Up to 99 units can communicate to a host computer on a single RS232 or RS422 loop. Note: Comes complete with operator's manual, mounting bracket, gasket, and two screws. For 220 Vac power, add suffix "-220Vac" to model number, no additional cost. For 24 Vac power add suffix "-24Vac" to model number, no additional charge. For RS-232 or RS-422 output, add suffix "-RS232" or "-RS422" to model number, add $130 to price. For field-selectable 4-20 or 0-20 mA output, add suffix "-A" to model number, add $135 to price.